Also known as three-cusped pangolins, Tree Pangolin’s grow to about 90 cm long, which includes their long tails. All pangolins have long curved claws on their front feet, while tree pangolins also have long claws on their back feet, plus a soft pad on the tip of the tail, to assist with climbing. Tree pangolins have very long tongues that are about 25 cm long and covered in a sticky substance to catch ants and termites. These tongues are actually attached to the pelvic bone and go up through the chest and mouth. They are nocturnal hunters and hide in tree hollows during the day. 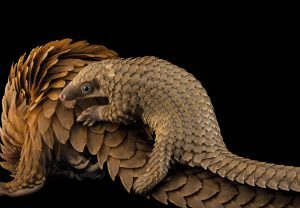 Pangolins are best known for their scales that are used to protect them from predators such as leopards, hyenas and pythons. When threatened, they roll up into a tight ball to protect their soft bellies. These scales are made out of keratin which is what our fingernails are made of. When baby tree pangolins are born it takes a couple of days for their scales to become hard. They hang on to their mother’s tail or back until they are able to walk around by themselves. These guys are found in forests throughout western and central Africa. They are considered vulnerable to extinction due to over hunting.